Make this spyglass telescope and you will be the first to discover the new world from your make believe perch in the crowsnest of the Santa Maria or spot pirates roaming the seven seas. 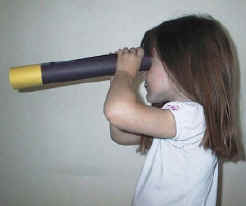 This spyglass is easier than the more difficult version and would be appropriate for ages 3+. Optional: Take a small square of plastic wrap and cover one end of the paper tube. Secure the plastic wrap with tape. This is the glass lens for your spyglass Don't worry if it is not neat because you will be covering the edges of the plastic wrap in the next step. Cover the outside of your paper tube with construction paper. (You choose the colors) Add a narrow strip of yellow around the end that has the glass (plastic wrap). Optional: You may like to decorate your spyglass with stickers. Kaitlyn had fun decorating with balloon stickers but moon and stars or ocean animals would be great too.